I suddenly had the urge to google my name this morning, and, along with my thesis paper, this was what I found. Read on. 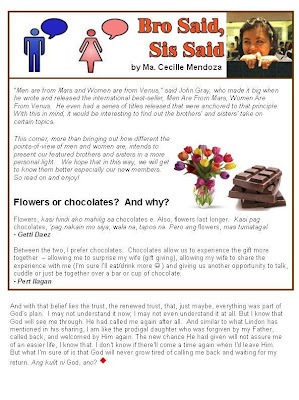 I suddenly remembered sharing this in SOLV way back in March 2009, after the Crossroads Retreat that they facilitated in Tagaytay. I was so struck by the homily and the sharings of the other retreat participants that I had to share myself. 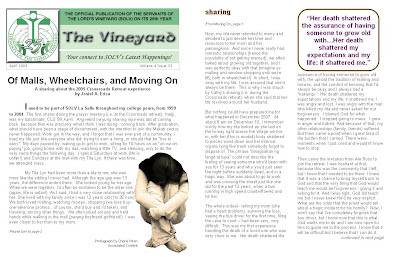 I was contacted by Sis Aby, who was the Editor of The Vineyard, and asked me if it's ok if they print it. I hesistated a bit but then said yes. I never got a copy of the newsletter, so I thought they must have changed their minds, until Bro Dale ym-ed me and said that he read my testimonial. It was only now that I finally saw the copy of the newsletter. Did God's people stumble and fall beyond recovery? Of course not! So you ask, "Will I be healed of this hurt/misery/failure?" There is your answer. Kaya lang, so sad ng ngyari sa tita mo. Ang hirap talagang mag move on pag naging close ka sa isang tao at biglang nawala. This is the time na kailangan mo ng mga kaibigang maiiyakan, family na susuporta at siyempre si Lord. Her sudden death was a tragic suprise. I had a hard time accepting it. I blamed God for what happened and went downhill from there. True. Family, friends, and God saved me from insanity. I am blessed.